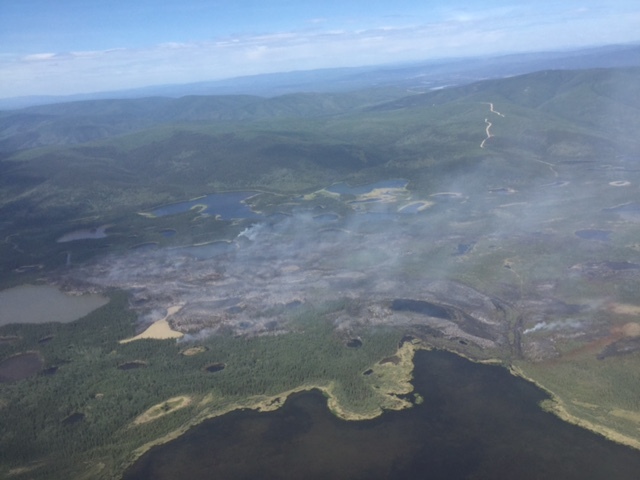 Firefighters on the ground and in the air are continuing to battle the Tetlin River Fire near Tok and their efforts to protect the community of Tetlin have been successful thus far. The Tetlin River Fire grew to approximately 1,000 acres on Saturday with increased fire activity on the northwest and southwest corners, which pushed the fire toward an airstrip on the edge of the village. However, firefighters and water-scooping aircraft were able to keep the fire from encroaching on the village. 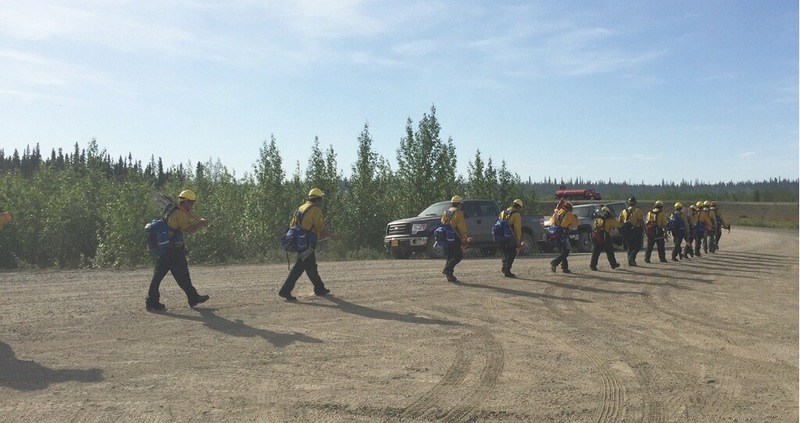 More than 130 personnel, including 16 smokejumpers from the BLM Alaska Fire Service and four 20-person crews from the Alaska Division of Forestry, are working to suppress the fire. Four more crews are en route to the fire, which will bring the total number of personnel to more than 200 by the end of Sunday’s operational shift. A Type 3 incident management team from the Alaska Division of Forestry will assume control of the fire at approximately noon today. The fire is located south of the Tanana River, just outside the Tetlin National Wildlife Refuge. It is approximately 20 miles south of Tok. Traffic on the highway has not been impacted. 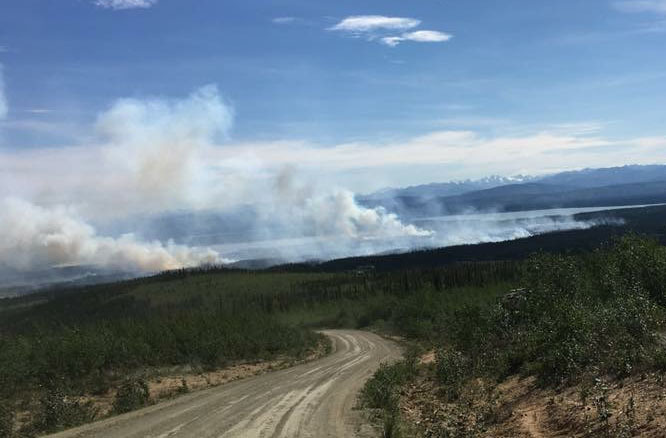 Tetlin resident Angie Isaac took this photo of the 1,000-acre Tetlin River Fire at 4:30 p.m. Saturday on the road leading to the village, which is located approximately 15 miles off the Alaska Highway south of Tok. No evacuations have been ordered for the Tetlin community, though elders have been have been asked to be prepared to leave if the fire advances on the village. The fire is threatening approximately 120 residences in the community, which is located about 16 miles off the Alaska Highway. Firefighters contended with high winds and hot, dry weather on Saturday. Fire activity increased late in the afternoon as unburned pockets of spruce within the interior of the fire burned off. The fire spotted out from the spruce to willow hardwoods in some places and the hardwoods were receptive fuel sources, an indication of how dry conditions are in the Tok area. Firefighters are focused on securing the north flank of the fire closest to the community and the village airstrip. A Red Flag Warning for high winds remains in effect in the eastern Alaska Range but not for the Tok area. Today’s forecast in Tok calls for temperatures in the 70s with south winds of 5-15 mph. The cause of the fire is unknown at this time but is believed to be human caused and is under investigation. 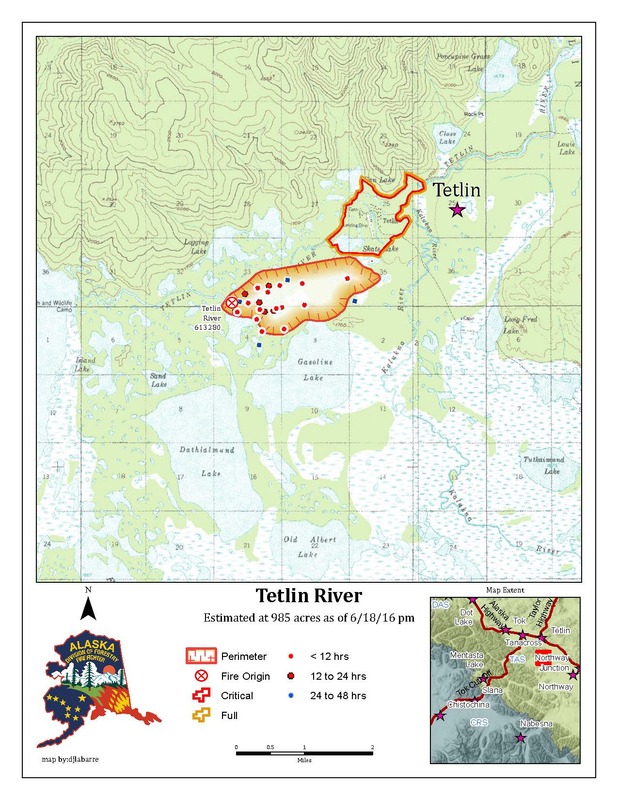 A map from the Alaska Division of Forestry shows the perimeter of the Tetlin River Fire approximately 20 miles south of Tok.